[Did you ever get a rush of motivation out of nowhere to, say, clean every drawer in the house? Every one? Full of energy, you go from room to room, drawer to drawer, pulling out the various effluvia you’ve collected over the years and NOW you’re going to clean house. …What is all this junk?!? Why do I have this stuff again? 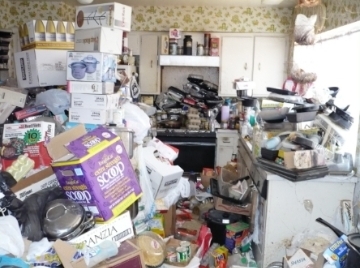 You begin to question your sanity, wonder if you shouldn’t call a reality show to film this mess and at least make a buck off of this on ‘Hoarders’. And then you find that thing that you found so long ago that you forgot that you had it. It’s really why you decided to clean out every drawer in the house in the first place – you just didn’t know it. Next Post Can You Make Ice Cream With Atkins Shakes? I have been missing the Sunday addition of your adventure in dieting. I, also, think having a “tool box” of easy to assemble, not much cooking, foods to eat makes Atkins easier. Every once in awhile I find something “new” to eat and that energizes the meal plan. Right now I think I am not eating enough. Just as bad as eating too much. I also can’t deal, digestively, with the flax and almond meal Muffin in a Minute. I used to be able to have a couple of them a week with cheese or peanut butter, but not anymore. My body composition must have changed. I try NOT to find subs for foods I am not supposed to be eating. So no low carb brownies or bread. Last year, in the early weeks of Atkins, I did eat the flax flatbread made by Josephs. A lavash. It made a very lovely grilled cheese sandwich. My crisper drawer is filled with flour subs for any baking I might want to do–it seems more like chemistry than baking– peanut flour, wheat gluten, almond meal, flax meal etc. What I want most of all is CEREAL and milk (soy or almond or just heavy cream). I keep looking, hoping to find something very high in fiber and low in carbs. Probably have to be a mixture of nuts and seeds. If I am not going to lose any more weight–then I want to try and live a more normal life. One that includes cereal. I don’t want bread or pasta or pizza. I can live the rest of my life without those things. But cereal would make me very happy. You made me realize something, Joanna: perhaps a stall should be a joyous time – a time of eating ‘forbidden’ food in moderation. Maybe it should be a time where we rest – and give our bodies a rest. Gather up some emotional energy and splurge – and since a ‘splurge’ after dieting for a while can be something as simple as a mango – why not? You still watch your weight and don’t allow it to creep back up – but you relax and enjoy the view from the plateau rather than struggling with it. Bring patience into it, and wait until the time is right for the next phase. Perhaps most people fail at long term dieting because most people don’t do this – they double-down when their body cries ‘uncle’ and end up flaming out. PS – Cereal? No sweat – I got you covered. Wow. I think you are right. I am happy eating these few “forbidden” items and still maintaining the same weight ( I’m going by my clothes not the still broken scale). I am smiling more and not grumping about the stall. Something will happen. Someday. And I will lose a few more pounds. Perhaps even 15. And, eventually, another 15. I did some volunteer work yesterday and got to see many people from my past employment. They all were so happy to see me “looking different”. Shorter silver hair and less body mass. My daughter says I may be stalled but I am still looking smaller and smaller. I can’t see it. I feel enlightened. Realiy I never had a clue why I was losing weight when I was losing weight. I would just be down a few pounds and then I would seesaw up or down 2 to 4 pounds until the next drop. I never knew how or when it would happen. Your Squeak&Snort Crunchies sound disgusting. I happen to have two snack bags of rinds and one open bag in the cupboard. I bought them so I could find out if they were really something “good” to eat. I think they have the same taste and texture that those rice puffs UPS uses in it’s packing have (yes, I tasted one). But the rice packing would dissolve in a bowl of milk. The toy should be something that makes little pig noises. I mixed one small box of Alpen SF muesli with a tub of trail mix (mostly seeds and nuts) after picking out all the dried fruits, then added one sleeve of Fiber One. I had it this morning with heavy cream (too much) and will try it with SF almond milk next time. Half cup of the stuff is enough. It did wear off sooner than the eggs or ham and cheese rolls do. I though the cream would add enough fat. I was wrong. It’s way better eaten right out of the jar, by the handful. I will not be doing that.